Groups containing siblings is nothing unusual, bands made up entirely of siblings is not too uncommon, but bands with four siblings from a charting father is a much rarer feat. In 1971, Johannesburg-born, singer songwriter, John Kongos had two UK hits which both reached number four and they were He’s Gonna Step on You Again and Tokoloshe Man. The former was the basis for the Happy Monday’s hit Step On which made the top five in 1990. In the 2010s, his four sons Dylan, Daniel, Johnny and Jesse formed their band called Kongos. 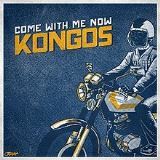 They are clearly fussy about their name because, according to their website, they emphatically say, pronounced “KONGOS” – KONGOS is spelled like this. There’s no ‘The’ in KONGOS. It’s not KONGO’s, it’s not Congos, congas, kongus nor kongas. They reiterated by confirming ‘No relation to Cheick Kongo, the conga drum, the Kongo people of Africa, Donkey Kong, Kongos Norman, Kongos pizza, Kongos Club in Oklahoma, Twitter.com/kongos, Kat Kongos and Lasse Kongos. So now you how to address them should you bump into them. They formed in 2003 and their roles are, Dylan on bass guitar, Daniel is the guitarist, Johnny plays keyboard and accordion and Jesse is the drummer – they all contribute vocals. They grew up in both Johannesburg and London but since 1996 they’ve been based in Phoenix, Arizona. They began playing shows and recording, eventually releasing their self-titled debut album in 2007. After years of touring and promoting themselves by emailing record labels, agents management companies, they got their real break in 2011 when their track I’m Only Joking became a radio smash in South Africa. Their second album, Lunatic, followed which included the track Come With Me Now. It was a slow burner and had a cult following. Drummer Jesse said that the band almost moved on to pushing new material before Come With Me Now caught fire in 2014, three years after it was recorded and after being used in an ad for NBC Sports. It received renewed attention in 2016, when it was featured in Amazon Prime’s advertising campaign for their show The Grand Tour that featured the Top Gear team of Jeremy Clarkson, Richard Hammond and James May. Additionally it was used in the 2012 film Holy Motors, the video game Borderlands: The Pre-Sequel and the 2014 action film The Expendables 3. According to America’s Billboard magazine, the accordion-tinged rock song reached a new peak on Billboard‘s Alternative chart at number seven in its seventh week on the tally. It’s the fastest-rising debut top 10 on the chart since Lorde’s Royals in July 2013 and the fastest by a group since Flobots’ Handlebars in 2008. So what is the inspiration behind Come With Me Now? The brothers explained, “Lyrically, it’s about losing unnecessary fears and inhibitions. Musically, it was inspired by a South African style of music called Kwaito,” they told Nicole DeRosa. Dylan added, “Johnny (who wrote the song) was listening to a lot of that Kwaito music. The variations of style that the song went through were quite vast, but it always kept this Kwaito vibe. Our dad was definitely an influence, not only because of his music and career in the music business but also because of all the different styles of music and culture he exposed us to while growing up like opera, classic rock, African tribal music, jazz, Qawwali music, etc.” The song was an early fan favourite when the band was opening for Linkin Park in South Africa. They landed a record contract with Epic records after the radio station KTCL-FM in Denver, Colorado played the single 396 times and that was three days after WKQX-FM in Chicago spun I’m Only Joking 215 times. It shows that radio stations, when allowed to have the freedom to play something other than the same songs on rotation, can have a big influence.